Last week officials shut off water taps at 30 schools in Newark, N.J., after lead levels were found to exceed federal standards. Lead from aging pipes created a water crisis in Flint, Mich., in January and may do so next in cities in Ohio and Mississippi. “Yes, our water is safe, not only LA Unified, but LA has some of the safest water in the nation,” said Robert Laughton, director of the Office of Environmental Health and Safety for the district. Laughton detailed for LA School Report what’s different in LA, how LA Unified tests its water and a new program the district is rolling out for drinking water in the schools. The problems on the East Coast stem from lead pipes. “No one I know, no plumber has ever seen a lead pipe,” Laughton said. Pipes in California are made from cast iron, but what holds those pipes together does contain small amounts of lead. “The other issue is brass,” Laughton said, a metal alloy used in faucets that until Jan. 1, 2014, could be made up of at least 8 percent lead but now can be no more than a quarter of a percent, so “we are basically lead free at this point,” Laughton said. But to make sure no one is drinking water with lead, fountains and other taps where the water is used for drinking or in food preparation are flushed — by running water through them — for a minimum of 30 seconds each day throughout the district. There are about 48,000 drinking fountains in the district, and LA Unified tested all of them in 2008 to determine which ones had elevated levels of lead. Those offenders, which constituted about 2 percent of all fountains, were removed. But to be safe, all fountains have continued to be flushed and will be until the district completes a lead-mitigation program approved by the school board in September and begun about three months ago. Only about 40 schools no longer need to flush their fountains because they have been cleared by that program, part of a $20 million bond-funded drinking water program in which every school in the district will be surveyed. If any fountains require flushing because of their lead levels, the fountain is either removed if the school can live without it, or the plumbing is changed out or a filtration device is added. Within the next 18 to 24 months all schools will have been cleared and then flushing will not be necessary. 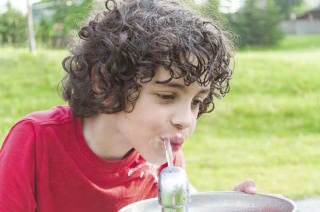 About 500 LA Unified schools currently have no more than one drinking fountain that requires flushing. All fountains in early education centers already have been switched to filtered water “as a precaution,” Laughton said. The flushing is conducted by different people depending on the campus — the plant manager, teachers, classroom volunteers or even students designated by the teacher — but each school’s principal must verify at the end of each month that the flushing was completed. Then the local district superintendent verifies the principal’s logs. And Laughton’s office performs safety inspections at each school every year to evaluate the flushing logs. Chief facilities director Mark Hovatter said in a report in January that eliminating flushing would save 9,500 gallons of water a day or 2.5 million gallons a year. It would also save 500 hours of custodial time a day or 130,000 hours a year. The district’s next frontier in drinking water is the installation of hydration stations. The vertical appliance is built into a pole and dispenses water, like on a refrigerator door, and will allow students to fill their own water bottles and encourage them to drink more water. The first two have been installed at Jefferson High School and at district headquarters downtown, but schools throughout LA Unified will be getting the hydration stations in the next few months, with 800 schools slated to have them within two years. “It was good timing,” Laughton said of the district’s efforts this year to ensure lead-free drinking water. But he noted about the current news stories on lead in drinking water, “What is lost is this is not a schools issues, this is a societal issue. It’s the same plumbing system everywhere. Courts, hospitals” — and homes.